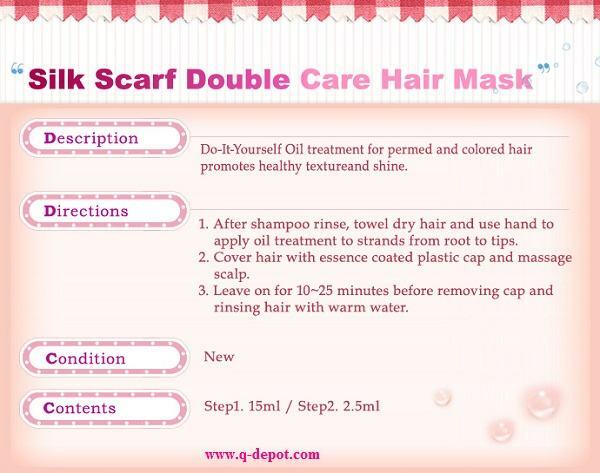 Take care of your hair by using this Silk Scarf Double Hair Mask from one of the leading Korean cosmetic brand in Asia, Etude House! This hair mask intensively treats the damaged hair by giving it moisture and nutrition. Enriched with jojoba seed oil, calendula extract and nano ceramide that makes the skin soft and smooth. 1. After applying shampoo, apply an appropriate amount to your hair. 2. Massage your hair softly with your finger tips. 3. After 10-15 minutes, wash your hair with lukewarm water.